Shiho Abe, a third-year student at Ishinomaki Municipal Girl’s High School who participated in the TOMODACHI MUFG International Exchange Program, spoke at the TOMODACHI Summer 2012 Celebration on September 22 at the residence of the U.S. Ambassador to Japan. Good evening. 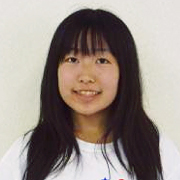 I am Shiho Abe from Ishinomaki City in Miyagi prefecture and I am a senior at Ishinomaki Municipal Girls High School. This summer, I participated in the TOMODACHI –MUFG International Exchange Program and visited Southern California. I would like to thank Ambassador Roos, the US-Japan Council and MUFG for providing me with this opportunity, and I’m grateful to be invited to such an honorable event. Last year, on the day of the earthquake, I was at my home with my mother and younger sister. At 2:46pm, we felt a strong quake. After the quake had ended, we drove our grandmother, who lived close by to my cousin’s house . As we attempted to head home to get our belongings in order to evacuate, we were surrounded by the tsunami from in front and behind, so we got out of the car and ran into a nearby house. Once we got in, in a matter of seconds the water rushed in and I realized that the water was up to my neck as I tried to float and wade. There was a man in his in 30’s with his grandparents in the house that my mother, sister and I escaped into. The man made a small exit and exited the house, then tried to rescue his grandfather that was closest to the exit. However, the grandfather had no more strength due to the cold and could not get out. Therefore, he rescued my sister who was the next closest to the exit, then he rescued me. However, by then I had been in the water for over an hour, and I lost consciousness due to the cold. Someone had used a hanger and hooked it to the backpack that I had on, and pulled rescued me. Five, six hours later I regained consciousness, but I wasn’t really sure I was alive. I heard that the man had tried to rescue my mother as well, but the second wave tsunami had hit and he was unable to rescue her. With this tsunami, I lost my mother and my home, and I lived in a relative’s house as an evacuee with a broken heart. One day, the U.S. navy band came to perform and they cheered us up and talked to us. This is when I realized that I enjoyed speaking English and my interest in the United States grew. That is why this summer, I wanted to participate in the TOMODACHI program and I applied. I gained an important family at my homestay, and I was able to find a dream by meeting new people and experiencing different activities. I met successful Japanese people in the United States and people who bridged the two countries, and I personally experienced the importance and courage it took to open the doors of opportunity that lay ahead. I would like to communicate and share my experience to the Tohoku people affected by the earthquake and would like to be of help for the recovery of Tohoku. In addition, I also want to repay the countries that had helped and supported Japan after the earthquake. As the first step towards this goal, I would like to study in the United States after I graduate from high school. The reason is because I am interested in education in America and American customs, and I would like to improve my English, which I have enjoyed since I was a little girl. My dream is to find a job where I can utilize English while getting involved with international exchanges and volunteering.